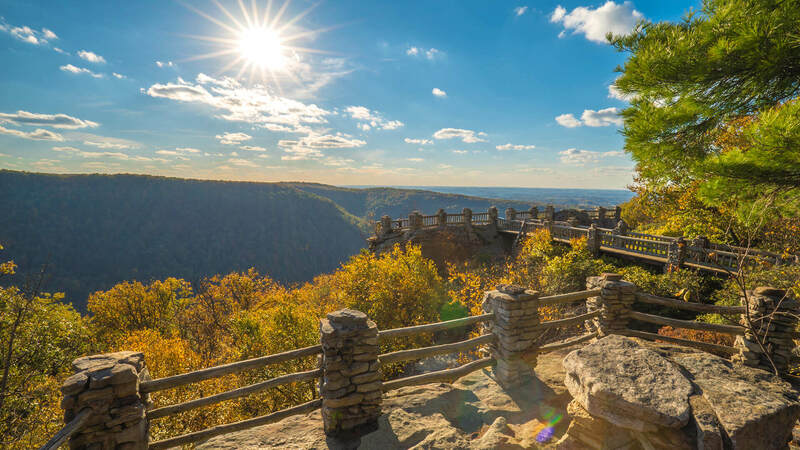 This exciting West Virginia city has a secret: a wealth of easily accessible scenic trails! Mountain biking, trail hiking, rock climbing and snow skiing are gateways to the awesome wildlife, fresh air, and breathtaking views. Grab your picnic basket and head to the Rail-Trail, open for non-motorized use, primarily walking, cycling, jogging and roller blading with a smooth durable surface for wheelchairs and all types of bicycles. This outdoor-lover’s city has an abundance of easily accessible scenic trails! Mountain biking, hiking, rock climbing, and cross-country skiing are gateways to the state’ wildlife, fresh air and breathtaking views. Grab your picnic basket and head to the Rail-Trail, open for non-motorized use, primarily walking, cycling, jogging, and rollerblading with a smooth durable surface for all types of bicycles and wheelchairs. Located within Morgantown’s city limits is the 91-acre WVU Core Arboretum. Approximately 3.5 miles of trails provide access to densely wooded areas and 3 acres of lawn planted with specimen trees. For a spectacular range of birds and mammals take a day trip to Cranesville Swamp. Lucky visitors may spot the rare northern water shrew or catch a glimpse of a bear rummaging through the shrub thickets surrounding Muddy Creek. Patience and binoculars may afford others a glimpse of any one of the more than 100 bird species, such as alder flycatcher, Blackburnian warbler, or the saw-whet owl. The 133-acre Cathedral State Park is an ancient hemlock forest of majestic proportions! Trees up to 90 feet in height and 21 feet in circumference form cloisters in the park. Over 170 species of vascular flora and over 50 species of wildflowers have been catalogued. Cooper’s Rock offers nearly 50 miles of trails, ranging from easy leg-stretchers to long, difficult day hikes. Make your way out to the 1,200 ft. scenic overlook and the famous Rock City with 30’ boulders and an abundance of top rope routes. Many of the park’s trails are suitable for cross-country skiing in winter. Make sure to stop by the overlook for a picturesque view of the mountains!